We are always striving to enhance the level of care we provide for patients. The recent addition of Zhaoli Lane, MD, to our pathology laboratory team means that physicians and patients can receive even more timely test results and pathology services. Dr. Lane completed a fellowship in genitourinary pathology at Johns Hopkins Medical Institution, and is a graduate of Wake Forest University School of Medicine. 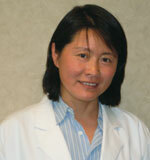 She completed her pathology residency at the Cleveland Clinic Foundation. To learn more about our pathology laboratory, call 336-274-1114.